"...you want to run around screaming Catcher in the Rye is damn good." J.D. Salinger, author of The Catcher in the Rye – the Catcher in the Rye Stacy Dacheux insisted on, the Catcher in the Rye of freshman year, the Catcher in the Rye of Conspiracy Theory, the Catcher in the Rye after Catcher in the Rye after Catcher in the Rye of my wife’s unfathomable teenage bookshelves – died yesterday. Catcher in the Rye is a short book, about two hundred pages in the pocket edition. It costs fifty cents. On the back cover of this edition it says in bright yellow: “A literary sensation.” And it goes on to tell about how good the book is. That’s phony as hell. It makes you want to puke when you read the book. Holden Caulfield could tell you that. He’s the central character. He’s the one that crawls around in your mind and won’t leave. He’s the one that makes you laugh out loud when you read it, which is silly as hell. He’s the one that makes you so depressed, which, again, is silly as hell, because it’s just a book, black print on white paper. Holden Caulfield isn’t real. I mean he just can’t be. But he won’t leave. He just keeps crawling around, damn it. And so here I am trying to write a book review of the damn thing with Holden Caulfield crawling around and saying “this is phony” or “this is crappy.” And Salinger, who wrote the novel, is there, too. And he’s so damn good, great. I mean he’s an artist that creates better than anyone else. And the book’s so damn good. You can’t use just words and all. You’ve go to stick in “damns” and “hells” because you’re trying to convey this feeling that the book isn’t like other books. You’re trying to say that it’s one of the great masterpieces of the twentieth century and that it’s the kind of literature that will live. But people say this about so damn many novels nowadays. You want to say that this book is really it. But you can’t because you know no one will believe you. So you just say it’s damn good and leave it at that. Like I said, the central character is this Holden Caulfied. Holden is sixteen, only he could just as well be twenty or around there. He’s real to you and me. As a matter of fact, he is you and me. You and me, especially. And damn if we can’t understand him and go along with him. He’s a student, only he doesn’t study and gets kicked out of all these schools. And he thinks. He thinks too damn much. And we can see him and we can see ourselves thinking the same things, believing the same things, feeling the same things. Only Holden Caulfield goes crazy. So what are we to do? What are we to say? Holden Caulfield goes crazy. Like you and me and he goes crazy. We laugh through the whole thing because it’s funny as hell. We listen to him summarize philosophic complexities in phrases like “it’s phony” or “that was about as sensitive as a toilet seat” of “I like Jesus and all but I don’t care too much for most of the other stuff in the Bible.” And on and on. The whole book’s like that. Funny but pregnant. And Holden is the hero, the funny looking hero that has a miscarriage. All the time you can see what’s happening, you know where Holden’s heading. But you don’t want to see it. You don’t want to believe it. In never sinks in until you’ve laid down the book and there’s no more to the story. You want to read more. You want to finish the damn book. Only it’s finished. And there’s this question that Holden keeps screaming at you from inside, which you can’t get out of your mind. This girl says, “You can’t just do something like that.” And Holden answers, “Why not? Why the hell not?” In the book Holden says he doesn’t scream the question. But it seems like he would. And you can’t find an answer for the damn thing. It’s not in the book. He asks other questions when he’s crawling around inside. He wants to know where the ducks in the lagoon go when the pond is frozen over. It’s a simple little question, but there’s no simple little answer. It all ties in with Holden and a world that’s frozen. To him, it’s a world of “phonies” and “crap” and “hate, for a little while.” He asks about where the ducks go when the pond is frozen over. Only there’s no answer in the book. The book gets at it, pricks at it, the answers to these questions. But you can’t grab the damn answers in your hand and look at them like you want. The whole book’s like that. Everyone’s always reaching. Holden falls off. The book is about life, like life, is life. It leaves you with the feeling that you have laughed and lived. Only it sticks with you as old Holden keeps running around in your brain. And you keep living with the book. And you want to run around screaming “Catcher in the Rye is damn good.” Only if people haven’t read it they won’t understand. They won’t believe you. Every guy should read TCITR once in HS or college. Salinger was an odd bird. Reading Joyce Maynard’s memoir confirmed it. Wow. That is all i can say to that summary of a book that i know spoke volumes to so many of us. 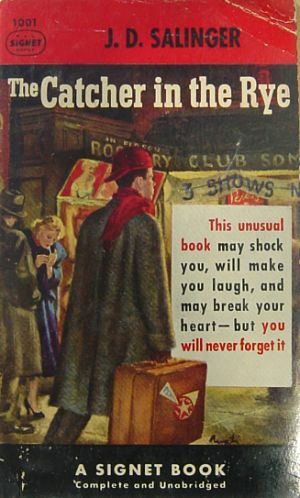 Maybe I am just off myself but I don’t understand the hype about Cather in the Rye. It was required reading in high school, I read it once again in at Auburn for a paper, and still a third time after Auburn but each time I finished the book feeling that I had wasted my time. I thought the book to be boring. I know I’m in the minority with this opinion and I’m not discrediting Salinger’s literary skills but this book was not for me. War Eagle. it’s better at age 30. just read it last year. Holden isn’t supposed to be a hero. He’s the most extreme personification of the struggle every young adolescent male goes through in trying to figure out how to be a man. He has every insecurity and misconception — where most of us only have some of these. That’s why everyone can identiy with at least something he says or does, from his confusion about girls to feeling compelled to find his life calling, but lacking the maturity to do so — which is why he comes up with something as irrational/simplistic as catching kids before they run off of a cliff in the middle of a rye field. So I hope no one can identify completely with Holden (because that would make them a total headcase), but if there’s nothing he says or does that makes you go “WOW I’VE HAD THAT SAME THOUGHT BEFORE” then you’re either lying or were the most well adjusted teenage male EVER. I successfully avoided reading this book in high school when almost everybody else in my class did (and college as well), but I may give it a chance now. However, I have a funny feeling I am going to find it over-rated, not because of the lack of quality of the “ratee” but rather the hype of the “raters”–kind of like I feel about The Grateful Dead. Hard to believe, now, that Dinsmore got in Big Trouble for that review, but it took big cojones to write and publish it in the early ’60s. Hard to believe what a powerful book CATCHER was when it came out, too. But that’s because society has grown. Uh, right?